Hello, from London! It’s been a whirlwind of a trip so far. Lots of great meetings, delicious meals and exploring different parts of the city! Our first meeting of the trip was with THE OUTNET – while at the pristine (and massive) NET-A-PORTER Group headquarters, we previewed the Spring/Summer ’15 collection of the brand’s own line, Iris & Ink. I know I mentioned Iris & Ink about a year ago when the first collection debuted, and have likely included pieces in many EDIT’s since then, but this was the first time I’ve actually ever felt or tried on any of the pieces. THE OUTNET was kind enough to send us pieces to shoot while we’re over here, and I selected this coat as my first choice. Iris & Ink was created as a one-stop shop for elevated basics and wardrobe staples, but without an absurd price tag. Think cozy cashmere boyfriend sweaters, luxe leather leggings and fashion forward (but super wearable) handbags. Isn’t this coat stunning? It’s such a classic silhouette and a creamy neutral shade that I know I’ll be wearing year after year. I’m obsessed with it. Keep your eye out for it – I’m sure you’ll catch me wearing this coat a bunch this winter! The other pieces from THE OUTNET I chose for this look include this snakeskin clutch by Vanessa Bruno and this Stella McCartney top. 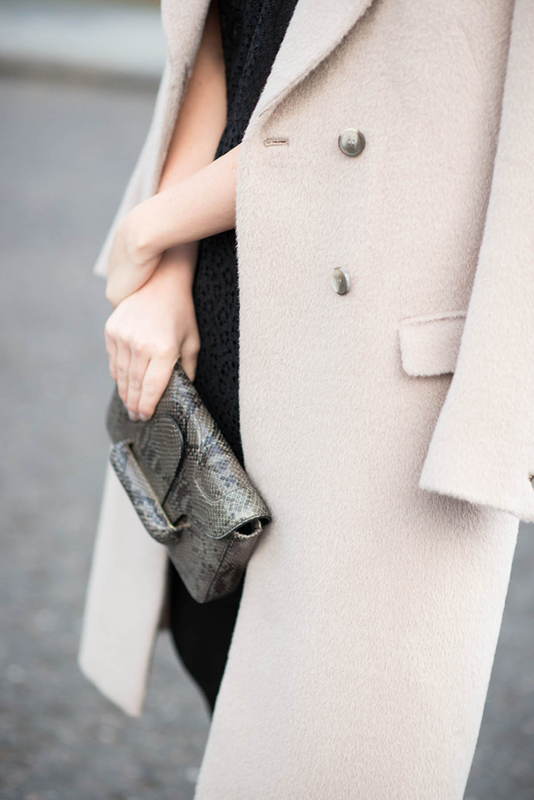 I’m kind of dying over the clutch – it’s a statement clutch that goes with everything. Need I say more? This Stella top is also a winner. The length, fitted waist and feminine eyelet detail make it anything but ordinary. Click here to discover other standout pieces from THE OUTNET! That coat is beyond beautiful! I love the color and the texture looks so luxurious! I hope you are having so much fun in London! This is such an elegant and chic outfit. Love it! That coat is so pretty, I love the shade and texture! That Stella top is perfection! Love this look! I love this long coat. It’s so chic and classy! Your clutch is amazing too! Your stella McCartney top is absolute perfection! You are so stunning! I love the contrast of the light coat with the black. The photos are beautiful. I’ve loving following along your trip through Instagram. I am obsessed with your coat! In love with your coat! Such a beautiful piece! Gorgeous! I love the color contrast! Love the lace top! Such a gorgeous look. These classic elegant looks are some of my favorites! I love how you transitioned the dress to a fall look. You look great! Love the coat and bag! gorgeous gorgeous coat!!! Loving it with the black lacey top too.